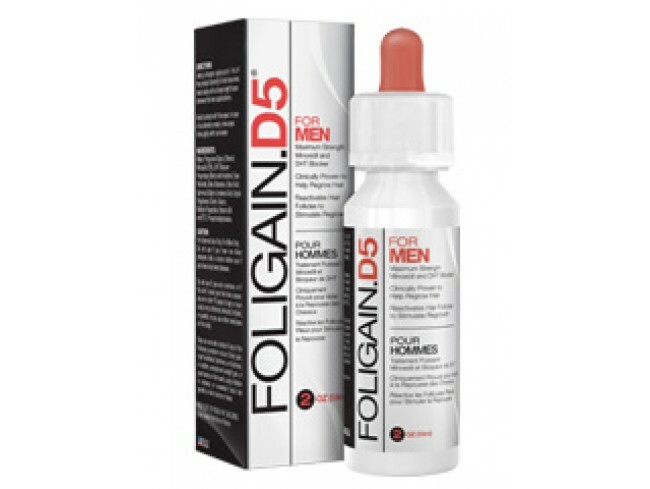 New Foligan D5 Minoxidil 5% & DHT Blocker 59ml a 1 month supply These natural ingredients help regulate cellular nutrition, stimulate proteins for biosynthesis, strengthen extra cellular papillary, control sebum production, reverse damage caused by DHT and condition hair for growth phase. Ingredients, Water, propylene glycol, ethanol, minoxidil (5%), DHT blocker proprietary blend with azetinol, saw palmetto, beta-sitosterol, oleic acid, gamma & alpha linolenic acid, apple polyphenol, biotin, niacin, biotinyl-tripetide, vitamin B6 and B12, phosphatidylcholine. Directions For Use, Using a dropper, apply up to 1ml of the product directly to hair loss area; twice daily with at least eight hours between the two applications. Avoid contact with the eyes. In case of accidental contact, rinse eyes thoroughly with cool water. Warning: For External use only. For Men only. Do not use if you have low blood pressure. Ask a doctor before use if you have any heart disease. Keep out of reach of children. Keep away from fire or flame.